SoftMozart.es - ¿Qué hacemos por ti? 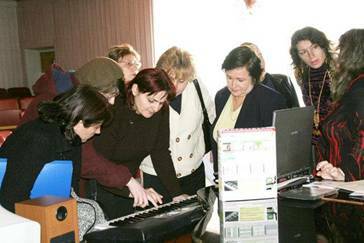 There are many methods and approaches in teaching how to play the piano and read music. We are NOT offering you another one! But if you use Grand Staff in teaching your students how to read music, we can be very handy for you. We have created an interactive tool that will be able to enhance your style of teaching. Our system makes Grand Staff visual and interactive. If you are uncomfortable with the “visual” part of our invention, which enlarges the notes and colors them red and blue, you can still take advantage of its “interactive” part. How our tool is going to affect the relationship with your students. Believe it or not, with the traditional way to read sheet music, you and your piano beginner are on opposite sides. Why? Because your job is to correct the mistakes and your student’s job is to make them. Correcting the mistakes means bringing bad news to someone. Your students unwittingly could blame all their frustration on you as a living source of the bad news. With our interactive sheet music, your students will sight-read piano albums from a computer screen. If they press the wrong key or don’t hold the note long enough, they won’t be able to move any further. After the piece is played, the computer (not you personally) is going to tell your students how many mistakes they made and how often they missed keeping the correct time. So, you are not going to be the “bad guy” who is nagging and pointing your finger all the time! The computer is the one to blame. Each student is going to compete with no one, but himself. Currently when you teach, what is YOUR role in the process of building skills? To watch and to correct. With our interactive Grand Staff you are a cheer leader, a friend and an appreciated expert, who knows exciting tricks and twists to make the music piece sparkle. How our tool is going to change your relationship with the parents of your students. Imagine this: kids are at home “practicing.” Currently, what are the criteria of their progress? Is it the time spent at the piano? Is it the number of repetitions? Parents who really care will be able to find out from you at the next lesson just how their little pumpkin really spent his time in practicing the piano: what she really learned and how long it will take to re-do the mistakes that have already become bad habits. But by using our interactive sheet music, parents of your students are going to feel in more control than ever before. With our eyeNotes™, even absolutely musically illiterate parents have full control over the effectiveness of their children’s practicing. The homework becomes goal oriented and measurable, making the practice more rewarding and productive for the children. Piano, music sight-reading, solfeggio, theory, ear training, chords in one session? Yes, it is possible! In addition to the visual and interactive sheet music that we call eyeNotes™, we have developed interactive software games that teach students theory and provide their ear training. These games are connected together and form our Gentle Piano System. There is not always enough time during the lessons to cover such things as playing by ear, picking the right chords for a melody, and enjoying entertaining theory games. Most of the time we teach students to play different recital pieces and sight-read. We do this because we are getting paid for the actual results of our lessons, and such results are primarily the recital pieces. The games in our system are VERY interactive. They can be played during the waiting time at the studio or at home. They are based on advanced algorithms that “feel” every move of every player. When students are weak, the games slow down and keep students at the same level, and they increase speed when students are strong. They can be played at home as part of the assignment you give, and you will definitely know what progress has been made. All you need to know is how the computer assessed your student’s last session. With our “Soft Way to Mozart” curriculum, your students will have many ear training exercises as well, and they will be taught how to get Tonic Subdominant and Dominant in the right places in the right time without much of the lesson time wasted and your effort spent. All you have to do is to be on top of things. You will have to combine, mix and create different delicious “dishes” from a lot of new “recipes” that our invention will bring you. Group lessons as effective as private. We all know that each of our students is unique and different and the personal, one-on-one approach is what we can offer them. However, this system is so interactive that even in a group setting, each of your students will be practicing at his or her own pace. You will still call it “group lessons,” but the intensity of the practicing and the RESULTS will be at least as good as with private sessions. So as you see, this is truly a win-win situation. When students are progressing, parents are happy and you are doing what you, as a professional, are supposed to do: teach the wonderful, exciting, most beautiful art form – music. This is why we are so confident that we can help you improve your piano studio, bring you more students and help you keep the dropout rate very low. Buy our ‘Soft Mozart’ package here. Register to become a member of our “Soft Mozart” community now. You will never look back.